The Pacific Ocean covers one-third of the surface of the earth and is comprised of thousands of islands that are scattered over a vast expanse of water with shifting winds, and strong currents. 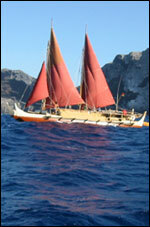 The movement of ancestral Oceanic people, or kanaka maoli, across remote Oceania was one of the most remarkable feats of open-ocean voyaging and settlement in all of human history. In the Hawaiian archipelago, the northwestern region were the most peripheral islands that relied heavily on interaction and networking between core islands (the main Hawaiian Islands) as a social mechanism to help reduce the possibility of extinction their geographically isolated populations. The Northwestern Hawaiian Islands were explored, colonized, and in some cases permanently settled by Native Hawaiians in pre-contact times. Nihoa and Mokumanamana, the islands that are closest to the Main Hawaiian Islands, have archaeological sites including agricultural, religious, and habitation features. Based on radiocarbon data, it’s been estimated that Nihoa and Mokumanamana could have been inhabited from 1000 A.D. to 1700 A. D. (Ref. 4). These islands pose the same dilemma as a score of other islands in Oceania, which were small targets for voyaging and often at some distance from their nearest occupied neighbor. All of these islands were either empty at contact or abandoned, having been occupied some time previously. Due to the environmental constraints of being small, geographically isolated, and not having enough resources to allow self-sustainability, demographic stability (in initial and later stages of colonization) have been thought to be the main reasons why interaction was so vital to these regions. Nihoa and Mokumanamana Islands are recognized as culturally and historically significant and are listed on the National and State Register for Historic Places and protected by the U. S. Fish and Wildlife Service in accordance with the National Wildlife Refuge System Administration Act of 1966, as amended. 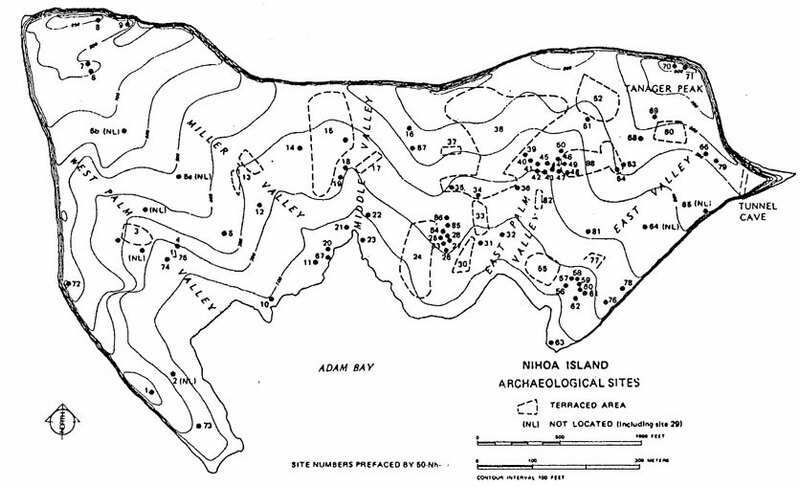 Archaeological surveys on Nihoa and Mokumanamana have documented numerous cultural sites and material (Emory 1928; Cleghorn 1988; Graves and Kikiloi, in prep.). Nihoa Island, where there is significant soil development, has over 88 cultural sites, including ceremonial, residential, and agricultural features. Mokumanamana Island has 52 cultural sites, including ceremonial and temporary habitation features. Several archaeological surveys have collected cultural artifacts from both these islands are now curated at the Bernice Pauahi Bishop Museum and University of Hawai‘i at Mānoa Archaeological Laboratory. The range in types of cultural artifacts stored in these collections is testimony to the various uses these islands and surrounding waters served for Native Hawaiians. Emory, Kenneth. 1928. 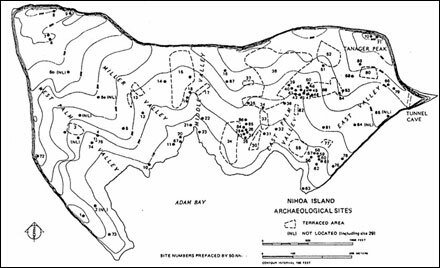 Archaeology of Nihoa and Necker. Bishop Museum Bulletin 53. Honolulu, Bishop Museum Press.Cleghorn, Paul. 1988. The Settlement and Abandonment of Two Hawaiian Outposts: Nihoa and Necker Islands. Bishop Museum Occassional Papers Vol. 28, p. 35-49.Graves, Michael and Kekuewa Kikiloi. in prep. Preliminary Reconnaissance of Archaeological Sites on Nihoa Island, August 2005. Prepared for U. S. Fish and Wildlife Service, Honolulu.